Did You Know Chiffon Cake Is So Easy To Make? 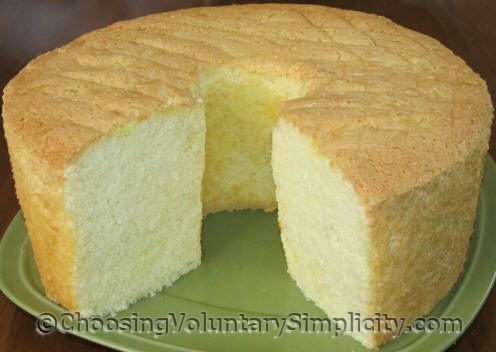 Home » Cooking & Baking from Scratch » Did You Know Chiffon Cake Is So Easy To Make? This chiffon cake is a very LARGE, impressive looking cake that is wonderful for a party or other special event. It’s also a very easy cake to make. I made two of these cakes over the weekend. One was for an anniversary celebration… white frosting, red roses and hearts. The other was for the photograph below… and for the freezer. Using a whisk, combine flour, sugar, baking powder and salt in a large bowl. Add the water, vanilla, extracts, oil, and egg yolks and beat until smooth. In another bowl (and with clean beaters) beat the egg whites with the cream of tartar until they are stiff. Using a spatula, fold the egg whites into the batter until just blended… don’t over-mix. Pour the batter into an ungreased 10-inch tube pan. Bake for approximately 65 minutes or until done. Cool the cake upside down in the pan. For special occasions, I frost this cake with my favorite frosting, but we actually prefer it without any frosting at all! The Apple Trees in Our Meadow… Heirloom or Wild? Have Necessities Become Luxuries Because of the Recession? Lovely, lovely cake! I wonder if I could do this without an electric mixer…I suppose people made these cakes before mixers existed, but not sure my “beating arm” would be up to the task. Quinn, if you can beat the egg whites by hand until they are stiff, you certainly could make this cake without a mixer. The stiffness of the egg whites is very important, though, because if the egg whites are not beaten enough, the cake will not be as light and will not rise as high. It’s certainly doable by hand… much easier with a mixer! My parent’s anniversary was this weekend and I made your cake for them. I even made your special frosting and used your idea of decorating the cake with red roses and hearts. The cake turned out beautiful and got tons of compliments. I did too. I can’t tell you how happy I was because I am new to cooking esp. baking and I don’t always have the best results. One thing I wanted to say was that I find your recipes to be very easy to follow. You explain everything so clearly step by step and this makes it easier for an inexperienced baker like me. This is a lovely cake. If anyone is afraid to try something that looks so complicated don’t be. Just follow Shirley’s directions and you will have the same amazing results I did. Thank you so much Shirley. Gosh that looks good! I wish I could reach out and grab a taste. I have saved this recipe and I’m going to try it. You should definitely try it without a mixer. I don’t have one and I bake with excellent results. Also, all that mixing burns calories soon to be consumed in said batter. 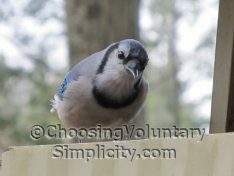 No – I didn’t know that chiffon cake wasn’t as difficult to make as it looks. You’ve given me the courage I needed to try something this challenging. I love to bake and this will be my next project.